Teriparatide has been shown to increase bone tumors (osteosarcoma) in rats. However, this occurred at doses higher than the usual human dose. It is unknown if this medication can cause bone tumors in humans. Therefore, this medication should not be used by people with increased risk for bone tumors (including people with Paget's disease of bone or people who had radiation treatment involving the bones). Who should not take Forteo Pen Injector? Teriparatide is used to treat bone loss (osteoporosis) in people who have a high risk of getting fractures. It is similar to a natural hormone in your body (parathyroid hormone). It works by increasing bone mass and strength. This effect helps to decrease the risk of getting a fracture. This medication is not recommended for use in children or young adults whose bones are still growing. Read the Medication Guide provided by your pharmacist before you start using teriparatide and each time you get a refill. If you have any questions, ask your doctor or pharmacist. A health care professional should instruct you on the proper usage of this medication. Also, learn all preparation and usage instructions in the user manual. If any of the information is unclear, consult your doctor or pharmacist. Inject this medication under the skin as directed by your doctor, usually once daily into the thigh or abdomen. Before injecting each dose, clean the injection site with rubbing alcohol. Change the injection site each time to lessen injury under the skin. What conditions does Forteo Pen Injector treat? Dizziness or fast heartbeat may occur within 4 hours after using this medication. These symptoms may persist for a few minutes to a few hours. This effect should go away after several doses as your body adjusts to the medication. It is best to lie or sit down if these symptoms occur. Muscle cramps/spasms or pain/swelling/bruising at the injection site may also occur. If any of these effects persist or worsen, tell your doctor or pharmacist promptly. Tell your doctor right away if any of these unlikely but serious side effects occur: fainting, constipation, unusual tiredness, mental/mood changes (such as confusion). List Forteo Pen Injector side effects by likelihood and severity. Before using teriparatide, tell your doctor or pharmacist if you are allergic to it; or if you have any other allergies. This product may contain inactive ingredients, which can cause allergic reactions or other problems. Talk to your pharmacist for more details. Before using this medication, tell your doctor or pharmacist your medical history, especially of: other bone disorders (such as bone cancer), high level of calcium in the blood (hypercalcemia), kidney stones. What should I know regarding pregnancy, nursing and administering Forteo Pen Injector to children or the elderly? If someone has overdosed and has serious symptoms such as passing out or trouble breathing, call 911. Otherwise, call a poison control center right away. US residents can call their local poison control center at 1-800-222-1222. Canada residents can call a provincial poison control center. Symptoms of overdose may include: nausea, vomiting, severe dizziness, unusual tiredness. Laboratory and/or medical tests (such as calcium levels) should be performed periodically to monitor your progress or check for side effects. Consult your doctor for more details. If you miss a dose and remember on the same day, use it as soon as you remember. If you remember on the next day, skip the missed dose and resume your usual dosing schedule. Do not double the dose to catch up. Refrigerate between 36-46 degrees F (2-8 degrees C) away from light. Do not freeze. Do not use this medication if it has been frozen. This medication should be used immediately after removing from the refrigerator and then returned to refrigerator after use. Recap the pen when not in use. Each pen may be used for up to 28 days. Mark the day when you start using the pen. Discard the pen after 28 days, even if there is still medication in the pen. Keep all medications away from children and pets. Are you taking Forteo Pen Injector? 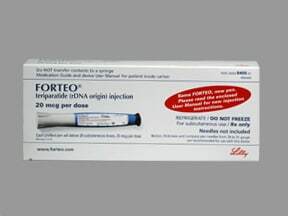 Are you considering switching to Forteo Pen Injector? How long have you been taking Forteo Pen Injector?